Coming after a long month in which major attacks were seen in Egypt's Sinai peninsula, Beirut, Baghdad, Ankara and Paris, the febrile environment has generated an understandable level of concern among people in major cities across Europe. Plots in the West are often disrupted - especially large-scale ones involving big networks of individuals. More recently, concerns had focused around the phenomenon of "lone actor" terrorism - acts undertaken by individuals who did not demonstrate any clear direction from a terrorist group or network. Image caption Anders Behring Breivik, who killed 77 people in two attacks in Norway, was a "lone actor"
And yet, while numerous such cases were disrupted, only three people were able to murder fellow citizens - Pavlo Lapshyn stabbed Mohammed Saleem to death in Birmingham, while Michael Adebowale and Michael Adebolajo murdered Lee Rigby in Woolwich. 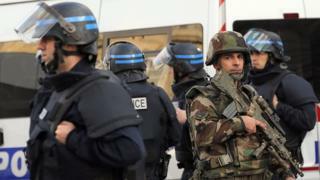 Image caption The French government has called the Paris attacks an act of war by a "terrorist army"
From the authorities' perspectives, plots are inherently harder to disrupt, given the individuals' lack of connections and links to known networks, meaning intelligence tripwires were harder to identify. At the same time, the current threat picture is complicated - with hundreds of Europeans and others fighting alongside IS having absorbed the groups ideology.